Way back before I started working from home, I used to supplement my income with a little mystery shopping. This was a great way to get free office supplies, a night out at a restaurant, or even a new haircut. When it comes to this line of work, mystery shopping, merchandising and product demoing are often handled by the same companies. While these aren’t necessarily work at home positions, they often provide the flexibility that many are seeking and can be combined quite easily for increased income potential. Mystery Shopping jobs can vary greatly. It may be as simple as ordering a pizza for delivery to check customer service and delivery times, or you may doing a detailed audit of a local store that takes 30 to 60 minutes and includes several aspects. In some cases your identity remains a “mystery,” in other cases you may make your identity as a mystery shopper known before or after your “shop.” Just as the work varies greatly, so can the pay. If you are required to make a purchase, this is typically reimbursed up to a certain amount. Merchandising jobs will require you to visit local stores to ensure your assigned company’s products are stocked and displayed correctly. This is usually ongoing work and pays relatively well. Many companies will allow you to pick up routine visits at several retailers and for several companies if they have them available. Product Demonstrators are typically those kind folks you see in the store handing out samples of new products or showing you the latest new gadget. These jobs usually pay well, as they are a bit more involved. Register with legitimate mystery shopping companies (see below list). Make sure your profile is filled out completely with age, location, interests, etc. Watch your email for opportunities. I recommend setting up a second email address strictly for these companies to make things easier. Read the instructions carefully before accepting a job to ensure you are available at the specified date/time and understand the job requirements. Complete the job as instructed. Don't miss the deadline. Don't forget your receipt. 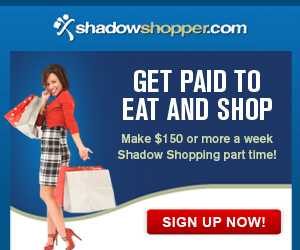 I recommend setting up a separate email address just for your mystery shopping, merchandising and product demo jobs. There are hundreds of these companies out there. When I did this I found it best to keep the incoming emails in a separate account. Also, create a spreadsheet with your usernames and passwords. Keep in mind, in most cases you are an Independent Contractor. You will be responsible for paying the taxes on your earnings. As you will be traveling for most of these jobs, mileage may be a deduction you can claim. Speak with your tax preparer about the details. Do pay close attention to the payment turnaround times if you are in need of quick cash. Even though some companies have gone to PayPal, you may still be looking at up to 60 days for payment and reimbursements. Start Slow! It’s tempting to want to pick up five jobs on your first day for maximum earnings. However, give yourself time to learn what each company entails before “bundling.” Some only require a quick survey submit, but other companies require very detailed responses. You may be sorry if you grab too many of the latter too soon. Gauge your real profit before grabbing a job. Some jobs pay very well, especially if it is urgent and they can't get it filled. However, if the pay is $7, you have to drive 50 miles out of your way and your total time spent in the store and filling out the questionnaire will be 1.5 hours, I would consider that a loss. Watch out for scams. Check cashing schemes went to an all new level when they hit the mystery shopping scene. Don't fall for it. While there are shops in the banking industry, no legitimate mystery shopping company will ask you to cash a check and send them the balance from your earnings. Consider getting certified. The Mystery Shopping Providers Association (MSPA) offers a certification course for a fee. While this is not required, there are some opportunities only available to those Gold certified. Mystery Shopping Providers Association has a job bank available for seeking out mystery shopping opportunities by location. Volition.com has a great forum for keeping tabs on the industry. Have you participated in mystery shopping, merchandising or product demoing? What tips would you add? You Will Love These Posts, Too! I’ve done a little bit of mystery shopping a couple of years ago and found that most of it wasn’t even worth the time unless you were going to that particular store anyways to buy something. I am in a rather rural area. I could make a good day for myself by “bundling” and by picking up urgent service calls. The less providers in your area the higher the rates I think you can get. I’ve been secret shopping since July and have also picked up monthly merchandising jobs in 6 Wal-Mart stores. I’m also an online graduate student. My question is – Do you have any tips or suggestions on how to plan shops? Right now I’m searching all of the shopper websites that I am a member of and making lists for every day and locations the available shops are at. There has got to be an easier, simpler way. Any ideas would help. Thanks! Hi, Teresa. I would try using the two links to job banks towards the bottom of this post. NARMS and MSPA both allow you to search for shops by location, and they cover numerous companies. Hi! I just wanted to thank you for your list of mystery shopping and merchandising gigs. I have worked as a mystery shopper and mystery shop report editor (through WordSmithPros) for nearly a decade now, and I too have been compiling a list, primarily for friends that want to make extra money for Christmas. I am very impressed with your list as it includes some companies I’ve never heard of! I honestly thought I was registered as an independent contractor with most every mystery shopping company out there! Thank you for this fantastic list- now I have more companies to work with! If you would ever like reviews written on about 3/4 of the companies you have listed, please let me know! Thanks, Tracy. And best of luck with the new registrations!